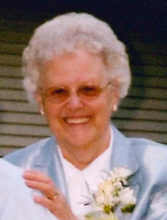 Alice Ruth Krause (nee Kohls), 96, of Watertown, passed away on Tuesday, April 2, 2019 at home. Alice was born on March 27, 1923 in Columbus to Louis and Johanna Kohls. She married Lester F. Krause on July 25, 1942 at St. Mark’s Lutheran church in Watertown. He preceded her in death on November 27, 2007. She was the oldest member of St. Mark’s Church having been baptized, confirmed, and graduated from St. Mark’s School. Alice graduated from Watertown High School in 1941. Lester and Alice farmed in the town of Farmington until moving to Watertown in 1958. She was a homemaker all her life and for a short time worked at Mid-State Shoe Company. She enjoyed crocheting and made many beautiful items as gifts and to sell at craft fairs. She enjoyed reading, puzzles and going to bingo. She and Lester also helped with Meals on Wheels and St. Mark’s Messenger. People who met her always commented on her beautiful smile, even at the end of her life. Alice is survived by her children Darrell (Vera) of Appleton, Bonnie (Michael) Stoltenburg of Johnson Creek and Lynne (James) Schultz of Watertown; grandchildren; Kellee (James) Kro, Jeffrey Klingbeil, Aaron Stoltenburg (Laura Passmore), Alisa Chatos (Doug Logemann), W. Korey (Judy) Krause, Rebekah Stoltenburg, great-grandchildren; Tyus, Logan, Bayden, Jadyn, Cameron, Lula, Brady, Zaya and Cole, and nieces, nephews, other relatives and friends. Alice was the last member of her immediate family, having been preceded in death by her sisters Marjorie Watson, Betty Schilberg, Evelyn Kohls and Shirley Canniff; brothers Eugene Kohls, Kenneth Kohls and Richard Kohls. She was also preceded in death by son-in-law Ronald Klingbeil. Visitation will be held at Schmutzler-Vick Funeral Home & Cremation Services on Monday, April 8, 2019 from 5-7 p.m. A service will be held at 11:00 a.m. on Tuesday, April 9, 2019 at St. Mark’s Lutheran Church with the Reverend James Backus officiating. A visitation will be held at 10:00 a.m. until the time of the service. Burial will follow at Farmington Lutheran Cemetery. Memorials can be directed to St. Mark’s Lutheran Church or charity of one’s choice. To send flowers or a remembrance gift to the family of Alice Ruth Krause, please visit our Tribute Store. "Email Address" would like to share the life celebration of Alice Ruth Krause. Click on the "link" to go to share a favorite memory or leave a condolence message for the family.